In today’s highly competitive industry, it’s essential that receipt printers are fast, reliable, and versatile. The TB4 is all of that and more. Being Epson compatible it offers easy installation, and eliminates the headaches that typically come with setting up and installing a new printer. Touch Dynamic understands the direct correlation between printer weight and ease-of-use. The TB4 weighs in at a low 1.5 pounds making it easy to service and load. 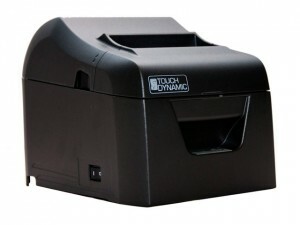 Touch Dynamic’s state-of -the-art thermal receipt printer boasts a print speed of 9.8 inches per second (250 mm/sec). It’s available in dual interfaces either Serial/USB or Ethernet/USB and includes all necessary cables for implementation.